In the environs of the Tüttensee crater (Chiemgau Holocene impact event), a new campaign of geological and geophysical investigations has been performed also including new excavation pits (now totaling 37). 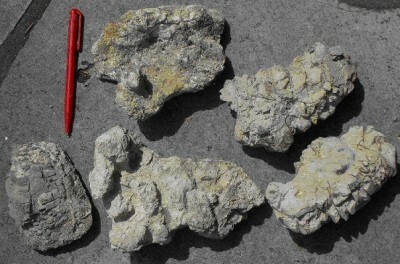 The ejecta layer exhibits the well-known composition of crushed, yet abundantly coherent clasts and the frequently strongly corroded skeletal carbonate and silicate cobbles and boulders in a clayey matrix (Fig. 1). Fig. 1. Typical, strongly wrecked cobbles from the Tüttensee impact layer in excavation pit No. 35. Together with these cobbles the quartzite artifact (Fig. 2) was recovered. As noted in previous articles, the sharp-edged fracturing can only have originated from impact deformation, and the extreme corrosion of the clasts can be explained by impact nitric-acid dissolution and/or carbonate decarbonization/melting. has clearly been elaborated by man (Figs. 2, 3). 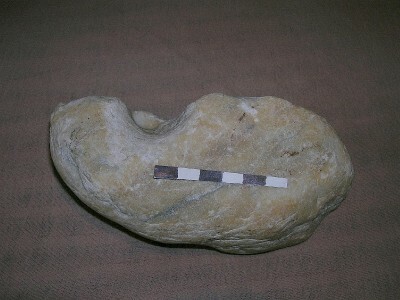 A funnel-shaped “picked” dent passes over into a drilled hole that breaks off midway through the boulder. A central rise at the base of the hole (Fig. 3) proves it was drilled with a hollow rod, possibly a hollow bone. Fig. 2. The drilled quartzite boulder recovered from the Tüttensee impact ejecta layer. Fig. 3. Close-up of the bore. 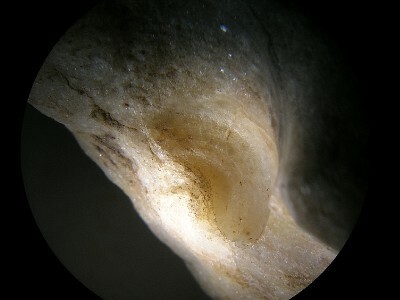 The central rise at the base proves the use of a hollow rod, possibly a hollow bone. It is well known that artifacts were produced from impactites and impact glasses, resp., (e.g., Elgygytgin impact structure [Gurov & Gozhic, 2006, Impact Cratering in the Earth’s History, in Russian], Libyan Desert glass, tektites). Here, in the Tüttensee case, obviously the first find of an artifact in an impact rock is documented. The full article on this find can be clicked here.